When it comes to pool fencing, there is one style that reigns supreme. Offering unparalleled views across your whole property from wherever you’re positioned, glass is the ideal choice for anyone who wants to take advantage of the luxurious finish that crystal clear glass provides. 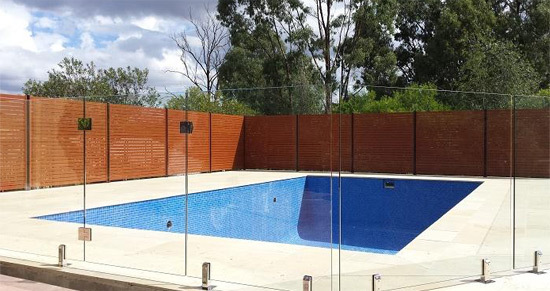 As the experts in everything pool related, our team has experience in designing and building stunning glass fences that not only look amazing, but meet the relevant Australian regulations and standards. We’ve outlined everything you need to know about the glass pool fencing installation process, so you can understand each part of the project from start to finish. Whilst there are safety regulations in place right across Australia, they actually vary from state to state, and even from council to council. Before you install a new pool fence on your property, be sure to check with your local council to ensure it’s up to code. We have plenty of experience talking with the authorities on these matters, and if we’re building your fence, we can also do all the liaising for you! To ensure your fence is installed exactly where you want it, it’s important to take the time to mark out the post positions before you begin cutting into your decking. A sting line offers a simple and easy way to create a straight line, every time. Then, pre-drill holes in your decking and secure your mini posts with screws. Remove your string line and place your metal protectors over the mini-posts, hiding the screws and protecting against rust. For your glass fence to look truly frameless, metal plates and grips are needed to support the glass. Start by inserting the metal plate inside the mini-post and then add the rubber grip. Ensure you leave part of the grip out to allow the glass to slide easily into the post. You may now insert the glass panels – this should be done with a partner as they can be fragile if you haven’t had experience in the installation process before. Double check the panels are even, and then you may secure the glass into the mini-posts with an Allan key. The hinges that you’ve chosen come with instructions – follow these to attach it to the supporting panel. Use your partner to help lift the gate into place, and hold it steady whilst you attach it to the hinges. Follow the instructions again when installing the latch to the opposite side of the gate and adjoining panel. Now, you’re able to wipe away any smudge marks, and sit back and enjoy the view. When it comes to water safety, fencing plays a critical role in protecting young children and pets around the family pool. By following this step by step guide, you can be confident your fencing won’t only be attractive and safe, but meets the regulations put in place to ensure the safety of everyone who wants to use your pool. If you’re looking at building a new fence or you want to upgrade your existing style, contact our team today to learn if glass pool fencing installation is the ideal option for you and your family.